This is the last of 5 dispatches about the visit to Vittel, France by a delegation from Wellington Water Watchers. (If you would like to read the complete list of dispatches go to our blog here). Karen Rathwell, Dr. Susan Glasauer (WWW Board members) and Mike Balkwill will be presenting a report back on our visit to Vittel, France, in Elora on Thursday March 7th. The meeting will be held in the Elora United Church, 75 Geddes Street. The meeting begins at 7pm – doors open at 6:30. This meeting is open to the public. The Vittel dispatches resonated with our many supporters and we received many emails in response. A sample of these responses is below – these comments speak for themselves. Thank you for this! While I have been against Nestlé practices for some time, I admit I was shocked at the revelation of their plan to make tap water undrinkable. This is appalling and a horror! Privatizing water is not only about the profit, but about eliminating its use except for by purchase…terrible. Very glad that you’re making these efforts on our behalf. Keep on! This is a very revealing story. However, it should not come as a surprise as companies that depend on natural resources will use every means available to advance and protect their access to these resources, it is a tough fight. KEEP UP THE GOOD WORK. Just signed on as a monthly donor. Keep up the good work. Thanks for the updates. This is very important stuff. It is good that those of us with more privilege also stand up for those who are much more disadvantaged. How vital and important that WWW is there!! This global transgression must be exposed. Thank you for your trip and thank you for these updates. We are standing with you!! Thank you from the bottom of my heart for your fight to save the aquifers of this world! I am deeply grateful for your work. My son (age 14) is very committed to what you are doing and shows it through his actions. He has informed me about some of the companies tied to Nestlé and those products are no longer purchased. This influence has extended to other family members outside of Guelph. Your dispatches are also forwarded to family outside of Guelph. These dispatches are great – interesting, eye-opening & telling. Thanks so much to all three of you for committing to this work. Connecting the dots has taken on layers of significance & meaning. Onward. I am 100% supportive of measures to prevent the abuse or monopolization of ground water resources. It makes me quite ill to think that the displaced people in Yemen and Syria (to name but a couple of locations) are desperate for water, a resource that should be freely available to every person on this earth, yet the only solution is for aid groups or government agencies to pay top dollar to Nestlé for bottled water which cost the latter next to nothing. The only thing that will ever come close to equaling such a travesty is to discover that one day people will need to pay for the air they breathe. Nestlé is an evil Goliath; it has enormous resources and there are no doubt many governments that could be enticed to declare that tap water is not for drinking. Imagine, a company headquartered in a nation that declared neutrality and made enormous sums of money by sitting out two world wars, is well on its way to monopolizing the world’s best water sources, acquired at little or no cost, with the objective of making everyone captive to buying their bottled water. Turning such a situation around is nothing short of a Nobel Peace prize undertaking – but it can be done. It’s going to take an unflinching commitment by many, many groups to work together and it will require some major financial support. This trip to Switzerland will hopefully be a big step in helping to shape how WWW goes forward. Big challenge; big opportunity. The leaders of Collectif Eau 88 are grateful to Franklin Frederick and to the Wellington Water Watchers for our solidarity visit. The French government is holding consultations on the future of the water situation in Vittel and the Feb 12th meeting was a chance for people in Vittel to organize themselves in advance of the government consultation. The global perspective provided by this forum strengthens their resolve to call upon the French government to Say No To Nestlé. The solidarity with people fighting Nestlé in Vittel, France and indeed around the world does not end here. I am making a special appeal today for donations in support of the work of Franklin Frederick and Collectif Eau 88. Your donation today will be sent directly to the campaign to stop Nestlé in Vittel. Together Wellington Water Watchers will continue to work with Franklin Frederick, Collectif Eau 88. A next step will be to call on Swiss NGO’s and Swiss faith organizations to sponsor a conference in Switzerland to draw attention to Nestlé’s global predatory water practices. The purpose of this is to increase pressure from Swiss media and Swiss parliamentarians on the Swiss government to regulate Nestlé. When we return to Canada we will meet with Canadian faith and labour organizations to ask them to engage with their counterparts in Switzerland in support of this conference. Franklin Frederick introduced Tamanna Kohi of the WWW Board to community leaders in Sao Laurenzo, Brazil – and she visited with them several weeks ago over the Christmas break. The recent election of Jair Bolsonar is a threat to public control of water in Brazil. Tamanna’s visit provides direct communication between WWW and community water protection activists in Brazil. WWW works closely with SumOfUs.org who provide support to anti-Nestlé campaigns around the world. Fatah Sadaoui, their French campaigner supports recent Collectif Eau 88 activities in Vittel. Wellington Water Watchers is talking with Story of Stuff and their Nestlé anti-to engage leaders of communities in the US fighting Nestlé in this emerging international coalition. Finally here in Ontario we will continue to press Premier Doug Ford to Say No To Nestlé in Wellington County. Thank you for your support and attention this week. The donations of supporters like you, as well as the supportive messages sent in the last week in response to these dispatches has been very encouraging to us and to the people of Vittel. It’s 6pm Tuesday evening in Contrexéville – a short drive from Vittel and the location of Nestlé’s second bottling plant in the area. I am sitting on a panel looking out at a room of 150 people, standing room only. The crowd is middle-aged and older – few if any younger people. Local farmers, people working in neighbouring towns and retired people. Sitting to my right are Dr. Susan Glasauer and Karen Rathwell from the Board of Directors of Wellington Water Watchers. To their right is Franklin Frederick, Brazilian water activist now located in Bern Switzerland. Jean Francois, President of Collectif Eau 88 is to Franklin’s right. To my left is Bernhard Schmitt, another leader with Collectif Eau 88, who is chairing the meeting. To his left is his son Francois who in addition to being a singer and comedian is translating Karen’s and my presentation to audience. Susan Glasauer speaks French and sits between Karen and I – translating from French ‘on the fly’ – the presentations by other panel members and the comments of members of the audience. There is one more thing to tell you to set the stage – as the evening discussion unfolds, in content and in emotional tenor – I can’t help but feeling like I am in a Save Our Water community meeting in the Elora Legion Hall! This is the ‘first’ of several “déjà vu’s” this evening. Bernhard Schmitt opens the meeting. He introduces the Brazilian and Canadian guests to the audience and we are warmly welcomed. Franklin makes opening remarks and summarizes the analysis of Nestlé’s global water strategy that I summarized in my previous dispatch. Franklin’s comprehensive presentation is peppered with anecdotes from his own experience with Nestlé in Brazil and Switzerland. There are audible gasps when he describes Nestlégate – the spying operation conducted against ATTAC and Franklin – the Swiss based grass roots group critical of Nestlé. Franklin’s opening presentation is a full 20 minutes – and the audience is attentive and with him the entire time. This is déjà vu # 2. On January 17th, Elora residents listened with rapt attention for 30 minutes as Jan Beveridge presented highlights of an independent hydrogeological study and as lawyer David Donnelly presented in detail the legal strategy Centre Wellington Township can implement to stop Nestlé’s proposed Middlebrook well. People here in France – as in Elora – care about their water and their community – and are prepared to organize to protect it. Susan Glasauer introduced this animation (for which we had created French sub-titles) describing Nestlé’s operations in Wellington County and the Say No To Nestlé campaign. Francois read the sub-titles to the audience in a dramatic narration! Dr. Glasauer talked about recent research which makes it clear that it may take up to 100 years for the impact of current water taking to be fully evident – and at which time there may be no chance to remediate. Karen Rathwell made a passionate speech about how we are all born of water, and of the waters of our mothers and grandmothers. She said it is her role – and the role of all the other mothers and grandmothers in the room – to ensure there is water for their granddaughters. The rest of the evening was an invigorating back and forth between the audience and the members of the panel. I was asked to address the question “How do we make politicians respond to our demands?” I made a 2 minute presentation in English on ‘primary and secondary targets’ (See pg. 8,9 of Campaign Planning Manual) and then had the new experience of room erupt in excitement in a delayed reaction to the translation. There was a spontaneous discussion in the audience of candidates for primary target and a quick consensus that President Macron must be the primary target of political pressure. (See here for more information about revealing, but not surprising, relationship between French President Macron and former Nestlé CEO Peter Drabek). This is déjà vu #3. People are eager to talk about the politics and strategy of social change. Too often I think people are only presented with technical details of ‘the problem’ and policy suggestions for ‘the solution’ without a real conversation about the strategy to create the politics that enables implementation of new and more just solutions. After the meeting Bernhard Schmitt tells us this was their first community meeting where they talked about the politics of change and the moral and ethical questions posed by Nestlé’s predatory water taking. Bernhard felt in previous meetings they had only talked about the technical issues. The evening therefore helped move the community to a new level of engagement and empowerment. This is the last ‘déjà vu of the evening. The meeting attracted widespread media. The Vittel story has been covered in recent months – but the occasion of international speakers drew the media back to the story. Der Spiegel – the German equivalent of Time magazine – did a 3 page story – published to coincide with our meeting. Multiple television and print media attended the meeting and have published stories this week. (I will attempt a short summary of media coverage in coming days). This is the third of five special reports that Wellington Water Watchers will send in the next week from meetings in Switzerland and France. In these special reports I will share more about what I learn about the connections between Nestlé water taking in other communities around the world. I was thinking of this as near the end of the evening meeting Franklin returned to the discussion of Nestlé’s links to the military. Franklin described the plan ATTAC (Swiss grass roots group) developed to hold a public “International Peoples Tribunal” in Switzerland on Nestlé’s global water strategy. Luciano Romero of Columbia was to be invited to present his testimony at the peoples’ tribunal. Luciano was a trade unionist and former employee of Nestlé’s Colombian subsidiary Cicolac. Lucian Romero was murdered by paramilitaries in 2005 after Cicolac falsely branded him a guerilla fighter. Franklin shared with the audience his concern that the person, who infiltrated the ATTAC group on behalf of Nestlé, shared this information in her surveillance reports. Franklin worried that this information contributed to Romero’s murder. Karen Rathwell (long time Board member of Wellington Water Watchers) and I arrived yesterday – Sunday Feb 10 – in Geneva, Switzerland. Franklin is a Brazilian water activist living in Switzerland. Franklin initiated bringing together Collectif eau 88 and Wellington Water Watchers for this international summit Feb 12 on Nestlé water taking to be held near Vittel, France. Dr. Susan Glasauer, Associate Professor in the School of Environmental Sciences, University of Guelph will speak at this forum on behalf of Wellington Water Watchers. Dr. Glasauer is a member of WWW Board. Vittel France may seem like a long way from Wellington County, Ontario. In fact it is part of Nestlé’s strategy to deflect attention from their worldwide operations (100 bottling plants around the world) by referring questions about specific operations to their local representatives. Nestlé works hard to cloak the connection between their various water bottling operations around the world. In fact Nestlé water bottling operations are part of a sophisticated global strategy and business model with public relations directed by their head office. 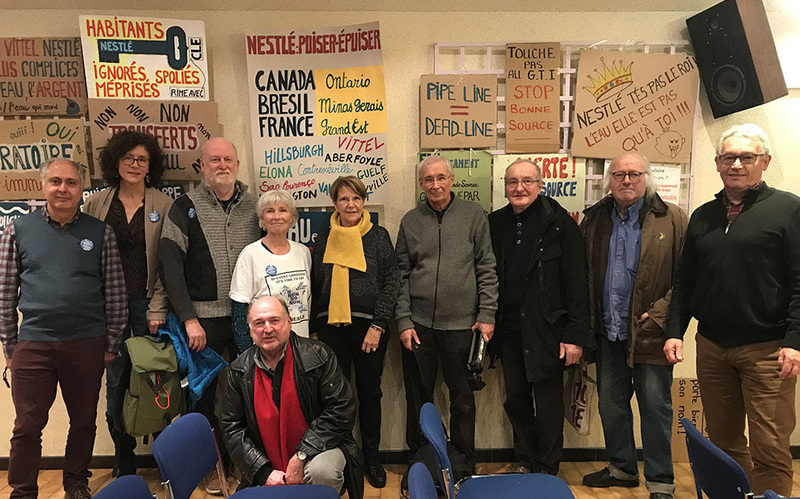 Wellington Water Watchers was invited to Vittel specifically to help connect the dots between the impact of Nestlé operations in Aberfoyle and Hillsburgh (and is proposing for Middlebrook well in Elora) and Vittel, France. In preparation for this trip WWW reached out to our friends at SumOfUs.org and Story of Stuff to also bring information about Nestlé operations in the US. –In many communities in the US and Brazil where Nestlé takes water the status of their permits to take water and the conditions that govern those permits are not transparent. -There are major differences of opinion between Nestlé, governments and independent experts and community advocates about the ‘sustainability’ of Nestlé’s water taking. Nestlé acquires the water for free – Nestlé pays no taxes to the French government on this operation because the water is considered an export product. Nestlé will continue to extract and bottle Vittel water for export if the pipeline is approved. If Nestlé will behave this way in Vittel, how can we trust what they say about their water taking in Aberfoyle and Hillsburgh? How can we trust what they propose for Middlebrook well in Elora? How can we trust that the Ontario government will protect water – rather than protect the business interests of corporations like Nestlé? The fight to protect drinking water is local AND global. As part of the local strategy Wellington Water Watchers demands that Ontario Premier Doug Ford protect drinking water and Say No to Nestlé. And… if this is how Nestlé behaves in France, and the US – what is Nestlé doing in communities in the global south – Brazil, and South Africa for example – where communities have fewer resources to resist Nestlé? This is the first of 5 special reports that Wellington Water Watchers will send in the next week from meetings in Switzerland and France. In these special reports I will share more about what I learn about the connections between Nestlé water taking in other communities around the world. Dr. Susan Glasauer and Karen Rathwell, members of the Board of Directors of Wellington Water Watchers are going to Vittel, France on February 12. They have been invited by Collectif Eau 88 to participate in a community forum on Nestlé water bottling. Dr. Susan Glasauer is an Associate Professor in the School of Environmental Sciences University of Guelph. Karen Rathwell is a long-time resident of Guelph and water protection activist. Collectif Eau 88 has invited Wellington Water Watchers to share the experience of Nestlé’s water extraction in Ontario to show how Nestlé’s behaviour in Vittel France is part of a global pattern of corporate water exploitation and privatization. -Nestlé has extracted 800K cubic metres of water/year in Vittel, France per year since 1990. -Nestlé pays no taxes to the French government because the water is an export product. The leadership of Collectif Eau 88 tell us that coming to Vittel to tell our story will help them show how Nestlé’s global business model is based on taking water for free. They say this will help them get media attention and increase pressure on the French government to Say No To Nestlé. The French government has organized a series of public consultations on the pipeline. The public meeting Collectif Eau 88 has organized for February 12 is intended to connect the dots between Nestlé’s water taking in countries around the world. It is also a fact-finding mission for WWW. A public meeting will be organized in Guelph in March to report back on what Susan and Karen learn by meeting with local people in Vittel. Nestlé extracts water from 100 bottling plants around the world. The fight against Nestlé is local and global.